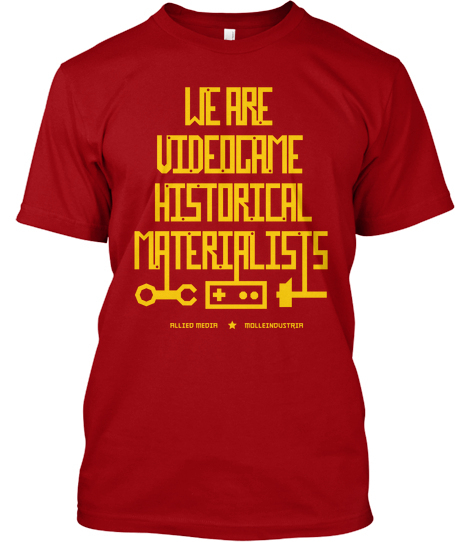 Support a good cause and fashionably declare your belief that videogame culture is funded on an economic basis and reflects class relations and struggles! Historical Materialism is less scary than Marxism and can be worn ironically! Started as a joke on Venus Patrol’s We Are Videogame Romantics, this T-Shirt is a fundraising effort for the annual game and simulations track at the Allied Media Conference I help to organize. I’ll post the line up soon, meanwhile you can find some information on the previous editions here and here. For each T-Shirt we make about $10 which will fund or subsidize travel and accommodation for speakers.